High-risk merchants face a wide range of challenges related to payment processing, merchant accounts, and chargeback fees. These make doing business costly and make it difficult to obtain a merchant account in the first place. Credit card companies manage these risks by monitoring the payments processed within these high-risk businesses, and high levels of chargebacks and fraud have caused Visa to implement new regulations related to these issues. Visa’s chargeback monitoring and repercussions for high-risk merchants allow the company to address excessive chargeback levels while minimizing financial loss. When chargeback levels are high, merchants must take the necessary steps to reduce their frequency and evaluate their own mechanisms for preventing fraud. It’s the responsibility of merchants to create a management system that includes strategies to prevent chargebacks from occurring. The banks that offer payment-processing services to merchants must also provide reports on any unusual activities that can indicate an increased risk of chargebacks. These reports are typically required when deposits and transaction amounts exceed the average weekly activity by 150 percent. Visa’s chargeback monitoring and repercussions are effective ways to help merchants limit the number of chargebacks they must deal with. It also gives them the strategies they need to implement long-term best practices. In addition, a designated period is granted to merchants so that they are able to minimize their chargebacks and avoid costly fees. Visa’s High Brand Risk Chargeback Monitoring Program gives high-risk businesses the support they need to reduce chargebacks. When a merchant is placed in this program, its payment processor receives a notification, which must then be passed on to the merchant within a period of 15 days. 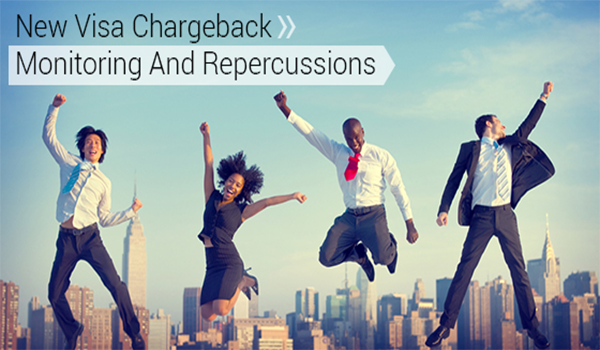 Chargebacks lead to many issues for businesses and their merchant account providers. By monitoring the level of chargebacks, Visa can help businesses identify the key factors that increase chargebacks. This monitoring creates a level of protection for Visa and merchant account providers. When businesses fail to implement strategies to reduce these and other payment issues, credit card companies face potential damage to their brand reputations. Visa’s notifications consist of multiple phases. These include the initial notification and warning of potential chargeback increases. If the number of chargebacks reaches the threshold point, the merchant account provider must offer a plan to normalize the chargeback frequency. Businesses that reach this point are at a high risk of losing their merchant accounts. Your bank reserves the right to take away your merchant benefits. Understanding Visa’s new chargeback monitoring and the repercussions it can have on your business is essential to preventing these and other issues. Reducing chargebacks benefits businesses, merchant account providers, and the credit card companies that offer payment methods to customers. Taking the steps to prevent chargebacks is a long-term investment in the success of your business.